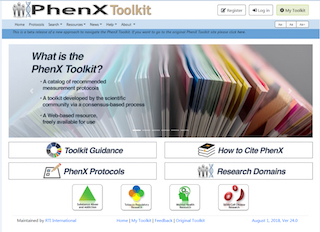 The PhenX Toolkit released a new design with an updated home page and Toolkit navigation system August 1, 2018. The new design is protocol-centric, making it easier for users to find exactly what they need. The new structure makes protocols easier to find. Search results now return protocols rather than measures (which may include multiple protocols). On a new page for browsing protocols, you can view an alphabetical list of protocols and use filters, such as Lifestage and Data Collection Mode, to narrow the list of results. In addition, a Search box at the top of every page and Advanced Search functions help identify protocols of interest. Individual protocol pages display everything you need to know about the protocol, including the protocol itself, information needed to administer the protocol (such as personnel and equipment needs), and the source. You can download protocols as Data Collection Worksheets (DCWs) in Word, as Data Dictionaries (DDs) in both RTF and CSV formats and as REDCap Instrument ZIP files. My Toolkit also has a protocol-centric focus. In addition to being able to archive protocols as PDF, DCW, DD and REDCap files, you can download protocols files from My Toolkit. Responsive design software recognizes different types of devices (i.e., smart phones, tablets, and computers) and adapts the display accordingly. There are more protocols available in Spanish and Chinese languages. An image carousel on the home page presents the goals and utility of the Toolkit. Click here to see the new look of the PhenX Toolkit, and provide comments and suggestions using the "feedback" option at the bottom of each page. The Geriatrics Working Group (WG), chaired by Dr. Mary Sano of the Icahn School of Medicine at Mount Sinai, recommended a set of Geriatrics measures for inclusion in the PhenX Toolkit. These measures were reviewed and approved by the PhenX Steering Committee and released in the Toolkit in July. The Geriatrics Domain includes 16 protocols, and "Additional Relevant Measures" that provide access to other geriatrics-related measures already in the Toolkit. A poster highlighting the Geriatrics measures will be presented at the American Society of Human Genetics Annual Meeting, October 17-19, 2018, in San Diego, CA (see "PhenX on the Move" below). Come see our poster, "The PhenX Toolkit: An update on a resource for geriatric research," from 3 to 4 pm Friday, October 19, 2018 (Program #2552F). We will also be in Booth 336 in the Exhibit Hall during the meeting, October 17-19, in San Diego, CA. We hope to see you there! Dr. Treadwell is a clinical scientist and health services researcher at the University of California San Francisco (UCSF) Benioff Children’s Hospital Oakland, Department of Hematology/Oncology, and the Northern California Comprehensive Sickle Cell Center. She is an adjunct professor in the Department of Pediatrics, School of Medicine at UCSF. She is principal investigator and director for the Sickle Cell Care Coordination Initiative funded by the National Heart, Lung and Blood Institute to use implementation science to improve care of adolescents and adults with sickle cell disease in five counties in Northern California. She is also co-principal investigator and regional director for the Pacific Sickle Cell Regional Collaborative, funded by the Health Resources and Services Administration, which seeks to improve access to knowledgeable care for individuals with sickle cell disease living in 13 Western states. Dr. Treadwell’s research integrates physical, behavioral and psychological processes, allowing for the identification of risk and resiliency factors and the development of more effective interventions for vulnerable populations in both high and low resource settings. Dr. Treadwell has expertise with measurement development, community engagement, conducting health care quality improvement projects, evaluating programs and assessing the health related quality of life for individuals and communities. Dr. Treadwell has participated in and led a number of clinical and health services research projects, including as co-investigator on a Human Heredity and Health in Africa (H3Africa) grant, funded by the National Human Genome Research Institute. Dr. Treadwell was a member of the team that developed the Adult Sickle Cell Quality of Life Measurement Information System (ASCQ-Me®), a patient-reported outcome measurement system developed and validated to provide methods to evaluate and monitor the physical, mental, and social well-being of adults with sickle cell disease. Dr. Treadwell serves on the Steering Committee for PhenX and is a member of the Sickle In Africa Consortium Independent Advisory Committee. Dr. Treadwell received her PhD in clinical child psychology from the University of Washington, Seattle, completed a fellowship in pediatric psychology at Children’s Hospital Oakland and completed advanced training in clinical research at the UCSF. Dr. Ritchie is a faculty pending in genetics, director of the Center for Translational Bioinformatics, and associate director for bioinformatics in the Institute for Biomedical Informatics at the University of Pennsylvania School of Medicine. She is also associate director for the Penn Center for Precision Medicine. A statistical and computational geneticist with a focus on understanding genetic architecture of complex human disease, she has expertise in developing novel bioinformatics tools for complex analysis of big data in genetics, genomics, and clinical databases, particularly in the area of pharmacogenomics. Some of her methods include Multifactor Dimensionality Reduction (MDR), the Analysis Tool for Heritable and Environmental Network Associations (ATHENA), and the Biosoftware suite for annotating/ filtering variants and genomic regions as well as building models of biological relevance for gene-gene interactions and rare-variant burden/dispersion tests. Dr. Ritchie has more than 15 years of experience in the analysis of complex data and has authored more than 250 publications. She has received several awards and honors, including selection as a Genome Technology Rising Young Investigator in 2006, an Alfred P. Sloan Research Fellow in 2010, a KAVLI Frontiers of Science fellow by the National Academy of Science from 2011 to 2014, and she was named one of the most highly cited researchers in her field by Thomas Reuters in 2014. Dr. Ritchie has extensive experience in all aspects of genetic epidemiology and translational bioinformatics in human genomics. She also has extensive expertise in dealing with big data and complex analysis including genome-wide association studies (GWAS), next-generation sequencing, data integration of meta-dimensional omics data, Phenome-wide Association Studies (PheWAS), and development of data visualization approaches. Dr. Ritchie received her PhD in statistical genetics and master of science in applied statistics from Vanderbilt University, and her bachelor of science in biology from the University of Pittsburgh, Johnstown. PhenX is supported by Genomic Resource for PhenX Toolkit (U41), funded by the National Institutes of Health's (NIH's) National Human Genome Research Institute (NHGRI), with co-funding by the National Institute on Drug Abuse (NIDA). Supplemental funding was provided by the Tobacco Regulatory Science Program (TRSP), the Food and Drug Administration (FDA), the National Institute of Mental Health (NIMH) and the National Heart, Lung, and Blood Institute (NHLBI). If you would like to be removed from our mailing list, please reply to this message with the word "Unsubscribe."